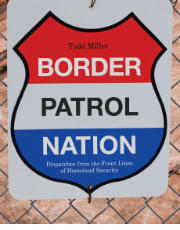 Todd Miller, a TomDispatch regular, is the author of Border Patrol Nation: Dispatches From the Front Lines of Homeland Security. He has written on border and immigration issues for the New York Times, Al Jazeera America, and the NACLA Report on the Americas and its blog Border Wars. You can follow him on twitter @memomiller and view more of his work at toddwmiller.wordpress.com.